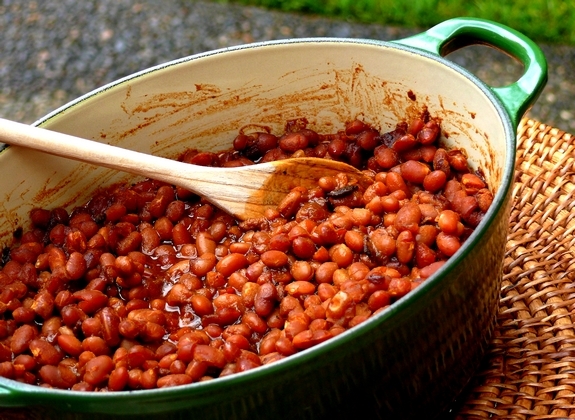 It’s that time of year when baked beans are the side dish of choice. Nothing goes better with barbecue ribs than a spoonful of sweet-smoky beans. Put down the can of Pork n’ Beans…these are easily made from scratch! Heat oven to 300o F. Cook the bacon in a Dutch oven over medium heat, stirring occasionally, until nearly crisp, 5-7 minutes. Add the onion, 1 teaspoon salt and 1/2 teaspoon pepper and cook, stirring occasionally, until the onion is soft, 4 to 6 minutes more. Add the beans, molasses, ketchup, sugar, mustard and 5 cups water to the pot and stir to combine, bring to a boil. Cover the pot and transfer to oven. Bake until the liquid is reduced by half, about 2-1/2 hours. Uncover and bake, stirring once, until the cooking liquid is thickened, 1-1-1/4 hours more. Stir in the vinegar and serve. I’m from Texas and have never seen an authentic recipe for baked beans! They sound delicious. Printing and saving this – thanks, Cathy! This sounds so yummy. totally making them next weekend! Man. My dad used to make these all the time. Always so good but something I never think to make! I love baked beans. Your recipe looks delicious, Cathy! I make something very similar, but with dark maple syrup in place of the brown sugar and some of the molasses. I seem to only have baked beans around the 4th of July. I need to change that. If vinegar is not your thing the try using yellow mustard instead. Not sure how much to use, just go by taste. That’s how my mom always use to make them growing up in Texas. Great recipe! Sadly, I don’t own a dutch oven and also needed my oven for something else, so followed directions up to the boiling point and finished in a crock pot. They came out great. Sorry you had an issue, never happened to me with this recipe. These are amazing. This is my “go to” recipe for baked beans. The only thing I do differently is I throw it all in the crock pot for about 10 hours. They are always a hit!! Thanks for all your awesome recipes! !